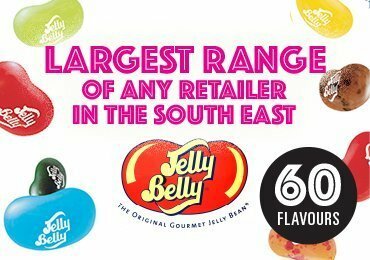 The Candy Room sweet shop in Eastleigh are pleased to offer HAMPSHIRES LARGEST Jelly Belly range of 60 mouth watering individual pic-a-mix flavours. The Candy Room sweet shop in an official Jelly Belly stockist. Jelly Belly The Original Gourmet Jelly Bean™ are made using only natural finest ingredients with true to life flavours. The Candy Room also offers the famous full range of Beanboozled ” Dare to Compare” furthermore the latest New 4th addition is now available. In October we will be launching our Jelly Belly Christmas range including Jelly Belly Advent Calendar also for New the Naughty or Nice. Beanboozled Advent Calendar, Gift Boxes Jelly Belly candy canes, Jelly Belly Mixed Emotions and lots more.